Judith Bernstein was born in Newark 1942 and currently lives and works in New York. She graduated from Pennsylvania State University with an MS & BS in 1964 and continued her education at Yale University, School of Art and Architecture graduating with an MFA & BFA in 1967. Radical Second-Wave American feminist artist Bernstein is currently experiencing a resurgence, and “Signature Piece 2010” is, as she explains, “a subtext of stardom, fame and ego that mirrors the artist and my own trajectory.” The resurrection of her work began in 2008 when she held her first solo exhibition in more than two decades at New York City’s Mitchell Algus Gallery. On its heels came a solo exhibition at The Box in Los Angeles in 2009, the “Signature Piece” show and an upcoming exhibit of her anti-Vietnam graffiti in Los Angeles in April. 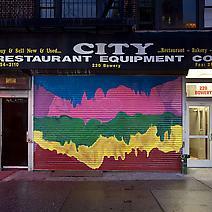 Her work has also been exhibited for After Hours: Murals on the Bowery in 2011 through Art Production Fund.